You must own a WW2 Rules and Accessories Pack or WW2 Starter Set to play. The Heinkel He.111 was a fast medium bomber, developed by the Luftwaffe in the â€˜30s and constantly upgraded during the war. It was the primary German bomber in the early years of the war. The He.111 was used in a variety of roles: it was used as a strategic bomber during the Battle of Britain, a torpedo bomber during the Battle of the Atlantic, and a medium bomber and a transport aircraft on the Western, Eastern, Mediterranean, Middle Eastern, and North African Fronts. 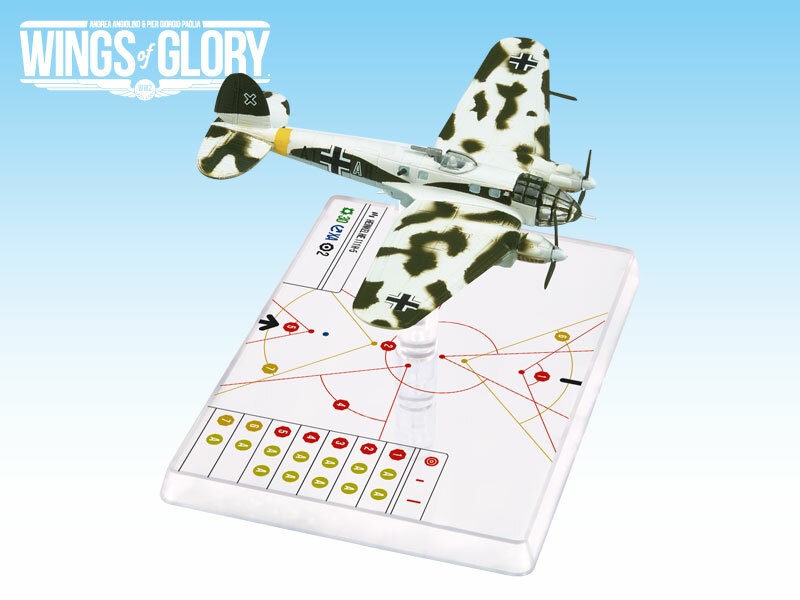 Designed to be used with the popular air combat game system created by Andrea Angiolino and Pier Giorgio Paglia, each WW2 Wings of Gloryâ„¢ Special Pack is a ready-to-play large size model, painted and assembled, 100% compatible with any other WW2 Wings of Glory game product. In each pack you will find all you need to play with the airplane: a special base with gaming stats, a variable altitude flying stand, and a specific deck of maneuver cards, as well as specific rules and components necessary to use the airplane.